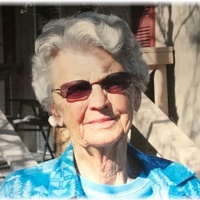 Opal Mae Steele, 94, of Quartsite, Arizona, and Salmon, Idaho passed away on June 19, 2018 in Salmon. Funeral services will be Thursday, June 28, 2018 at the United Methodist Church in Loup City with Reverend Jim Koontz officiating. Cremation will follow the service with burial to be held at a later date at the Soulville Cemetery near Boelus. Visitation will be one hour before service on Thursday. Memorials are suggested to the Steele family or donor’s choice. Opal was born to Otto and Alice (Caddy) Obermiller on September 5, 1923 in Loup City, Nebraska. Opal married Clyde Steele; they had four children Clyde Jr., Jim, Linda Kay and Shirley. Opal retired from the commercial garment business in the Portland, Oregon area, working with the Pendleton and White Stag Companies. She loved to square dance and did so for many years. She enjoyed traveling with Clyde for 20 years as a snow bird. Clyde died in 2005. She is survived by her children: Jim (Jan) Steele of Prineville, OR; Shirley Kempf of Salmon, ID; one grandson Jimmy (Amanda) Steele of Bend, OR; two brothers Harold Obermiller of Loup City, NE, Raymond Obermiller of Fremont, NE. Opal was preceded in death by her parents; the following siblings: Frank, Earl and Mary: her husband Clyde; children: Clyde Jr., and Linda Kay; grandson Chaddrick James son-in-law Richard Kempf.